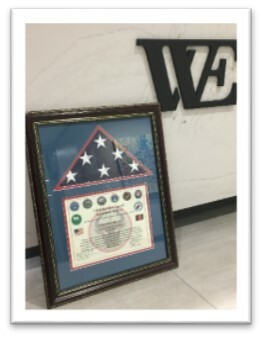 Whitfield & Eddy Law received the ceremonial United States Flag flown in honor of the firm on September 16, 2016 in support of Operation Resolute Support at Bagram Air Field, Afghanistan. Attorney Luke Craven is married to LTC Linda Craven, Battalion Executive Officer, 185th CSSB, Task Force Warhawk, 518th Resolute Support Brigade, who served in Afghanistan 2016-2017. LTC Craven is active in the Iowa Army National Guard since 2008 and served as an Aviation Officer in the U.S. Army from 2001-2008.